Our stove showroom is beside our Warehouse in Dunkeswell near Exeter. 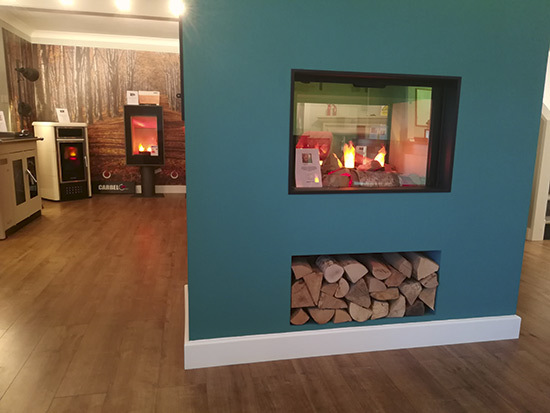 We have many different makes of woodburning stove, multifuel stove and boiler stove on display, as well as Energystore thermal stores, flue pipe and other fittings and components. We also have MCS accredited wood pellet boilers and stoves on show. This is a great opportunity to take a close up look at the stoves you are interested in before choosing the perfect one for you. Direct warehouse sales with immediate collection are available, so making further savings. Anna our showroom manager is happy to demonstrate any stove we have on show. Craig, our warehouse manager will unpack any models you wish to view. If you wish to look at particular stoves or to discuss the details of your flue design or get technical advice on the installation of an insert stove or a central heating stove, then you must contact us before your visit on 01404 892 892 or 0845 226 5754. This is to ensure we have the correct stoves or stove expert here to meet with you so you don't waste your visit. You can purchase any stoves direct from our warehouse and we can load stoves direct to your vehicle. 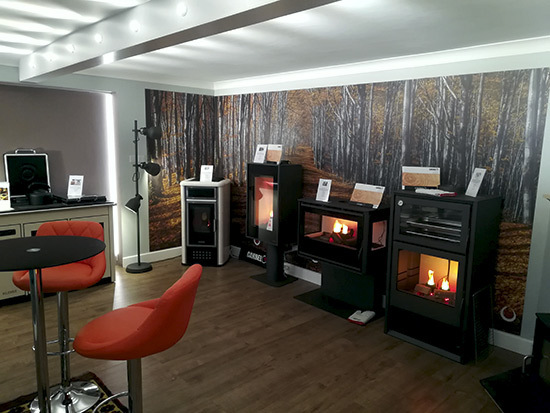 You can visit the showroom on Saturday by prior appointment - please email anna@stovesonline.co.uk. Please remember our stovesonline sales and technical team are in the office 9am-5pm Monday-Friday and Saturday 9am-5pm on 0845 226 5754. Make a day of it: there is a friendly cafe to get a cup of coffee and sandwiches, or the Aviator bar if you want a sit-down lunch. Dunkeswell is the site of an airfield so you can also watch lots of different types of planes take off. If you are after more adrenaline then you could talk to us about stoves and then do a parachute jump with Skydive UK Ltd or go cart racing at Mansell Raceway.